C1659. 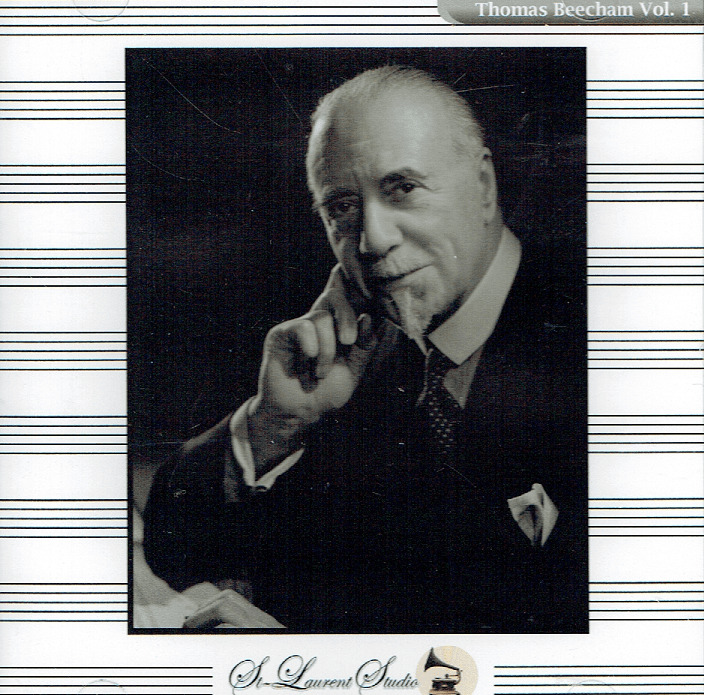 SIR THOMAS BEECHAM Cond. Symphony of the Air: Concert to the memory of Arturo Toscanini (who had died 16 Jan.), incl. Grieg, Berlioz (featuring Sir Thomas having a rip-roaring good time as he delightedly shouts at the orchestra!) 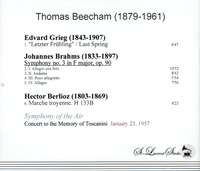 & Brahms (the latter's Symphony #3 in F; "Beecham gave a 'blazing' performance of it at the memorial concert for Arturo Toscanini in New York in January 1957 - John Lucas. Thomas Beecham: An Obsession with Music, p.331.)". (Canada) St Laurent Studio YSL T-765, Live Performance, 23 Jan., 1957. Transfers by Yves St Laurent. “Arturo Toscanini died on January 16, 1957, at the age of 89. One week later in New York, a memorial concert was held in Toscanini’s honor. Sir Thomas Beecham (1879-1961) conducted the Symphony of the Air (the NBC Symphony Orchestra, renamed after Toscanini’s retirement in 1954). 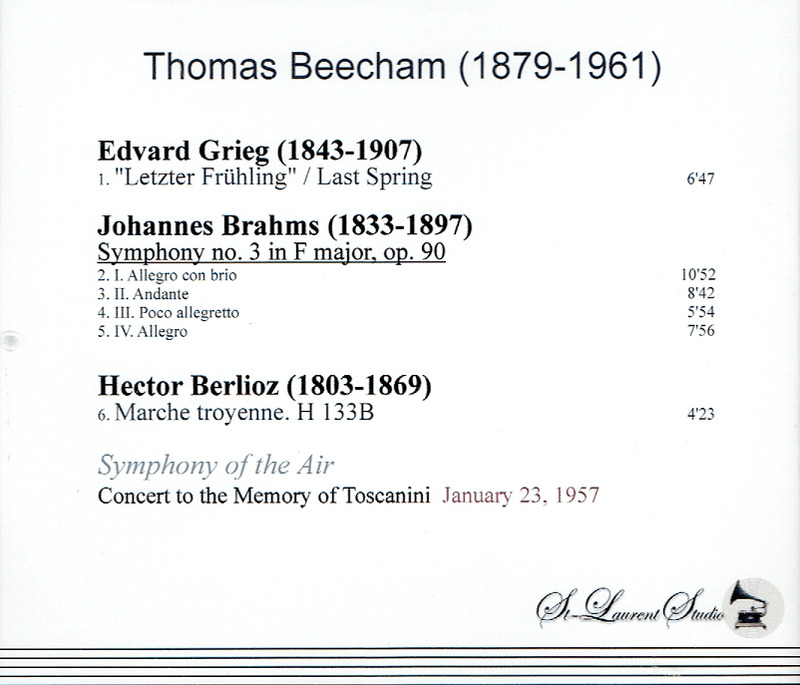 The concert included a performance of the Brahms Third Symphony, the only recorded document of Beecham conducting the work. This background would, on its own, make the new St. Laurent Studio release (available from norpete.com) of the January 23, 1957 Toscanini Memorial Concert of great interest. But Beecham, ever fascinating, and ever the showman (and I mean that in the most complementary way), gives us so much more. The disc opens with a touching performance of Grieg’s ‘Last Spring’, an apt memorial offering. The Brahms Third follows. On November 4, 1952, Toscanini and the NBC SO made a studio recording of the work. The time difference between the two versions of the opening movement (both conductors observe the exposition repeat) is almost a full three minutes (10:52, 13:45). But while Toscanini was often known, and criticized by some, for his choice of fleet tempos, it is Beecham who conducts the Brahms Third at a blazing clip. The opening is quite something to hear. After the two opening chords, Beecham and the orchestra are off to the races. There is real ‘brio’ in this Allegro con brio! The musicians are with Beecham step for step, and the impact is electrifying. Beecham relaxes the pace for the lilting second theme, and applies some lovely rubato in the bargain. Beecham explores this kind of contrast throughout the movement. Brahms’ restless, surging transformation of the second theme at the start of the development section is given a hair-raising treatment. Beecham’s shouted exhortations to the orchestra, both here and elsewhere in the performance, raise the emotional stakes even further. For all the speed and intensity of this rendition of the opening movement, Beecham is masterful in capturing the mystical beauty of the closing measures. Beecham is approximately one minute faster than Toscanini in each of the remaining three movements (I point that out for what it’s worth, which is probably not all that much). Beecham, who presided over magical wind playing by his Royal Philharmonic Orchestra, coaxes a beautiful performance from the Symphony of the Air winds in the second movement. The third movement has a lovely singing quality throughout, and a tasteful, enticing use of string portamento. The finale returns us to the hyper-dramatic approach of the opening movement, with Beecham once again in full-throated support of the musicians. For all the pervasive storm and stress, the Symphony’s concluding measures provide a heavenly apotheosis. No doubt, some will find Beecham’s approach to the outer movements of the Brahms Third exaggerated, perhaps overwrought. But the commitment Beecham and the musicians bring to the performance makes it a one of a kind experience. The concert concludes with a Beecham trademark, the Trojan March from Berlioz’s opera LES TROYENS. Beecham urges the orchestra onward (both with baton and voice) to a glorious performance, greatly appreciated by the audience (the only applause included on the release). “Though Beecham and Toscanini respected each other, the relationship always required from Beecham a distinct irony, often referring to ‘that Italian’ or ‘Arturo who?’ when engaged on the subject of their respective talents and repertory. But the atmosphere of this evening, in which the Symphony of the Air - which took up an independent existence in 1954 and gave their first public performance 24 October as part of the United Nations Ninth Anniversary Celebration. The intensity of the program commands our interest….Since Beecham never made a commercial recording the Brahms Third, his interpretation contains many points of interpretative interest, not the least of which is his taking the first movement repeat. In the course of the fierce development, Beecham’s vocal enthusiasm registers quite distinctly. In the course of the second movement Andante, several distinct string and wind lines emerge - too often elided by more glossy performances. The orchestra bass and cello lines carry a particularly potent weight this evening, and virtually every period comes to a thunderous climax. The last movement, too, especially its canonic play on the ‘Fate’ motif, incurs Beecham’s vocal assertions in concert with a manic drive to layer the texture with a radiant, personal anguish. "The Symphony of the Air grew out of Toscanini's NBC Symphony Orchestra. NBC had hired the best musicians, many of them first chairs of their orchestras, specifically to perform with Toscanini on NBC's radio broadcasts. Toscanini built the group into a lean, precision orchestra, recognized around the world. NBC dissolved the group after Toscanini's retirement in the spring of 1954. The first season was a financial and artistic success, and included a triumphal State Department-backed Asian tour and a summer season in the Catskills that drew 60,000 ticket buyers. A second Asian good-will tour was scheduled for the spring of 1956. Prof. Donald C. Meyer of Lake Forest College in Illinois has concluded that what happened next was character assassination by disaffected orchestra members, including one who was fired for drunken and immoral actions on the first tour and others who objected to the orchestra's hiring black and women players. They went to Brooklyn Democratic Congressman John Rooney and charged there were communists in the orchestra. Rooney used the allegations (which Meyer has concluded were unfounded) to attack the Republican administration State Department in the election year of 1956, as payback for Joseph McCarthy's similar attacks against the Democrats before the 1952 campaign. As a result, the tour was cancelled. The orchestra lost its Mutual Radio contract, much of its financial support, and a lot of ticket sales. The incident, says Meyer, was not the direct cause of the orchestra's eventual demise, but did start the process, abetted by poor management decisions. Despite much artistic success, morale slipped. Debt piled up, and deeply in debt its quality eroded as up to half its original membership had left by the time it disbanded, in 1963. Even so, the Symphony of the Air was an important voice for new music, led by such conductors as Reiner, Bruno Walter, Bernstein, Monteux, and Beecham, and made outstanding recordings."